Most Holy God, whose servant Tabitha thou didst raise from the dead to display thy power and confirm thy message that thy Son is Lord; grant unto us thy grace, that aided by her prayers and example, we may be given a new life in thy Spirit to do works pleasing in thy sight; Through Jesus Christ thy Son our Lord; who livest and reignest with thee, in the unity of the Holy Ghost, one God, for ever and ever. Amen. Dorcas (or Tabitha in Aramaic -- both names mean "gazelle") is mentioned in Acts 9:36-42. She was a member of the early Christian community in Joppa, a seacoast town of Israel, and noted for her acts of charity, in particular for making garments and giving them to needy widows. 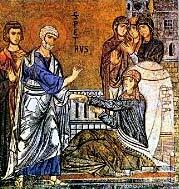 When she fell ill and died, Peter came to see her, and raised her to life. His words to her, "Tabitha, kumi," (Tabitha, arise), are reminiscent of the words of Jesus to the daughter of Jairus, "Talitha, kumi," (little girl, arise) as given in Mark 5:41. Whether this is anything more than coincidence is hard to say. If the Aramaic words of Jesus had been quoted by Luke rather than by Mark, one might suppose that Luke was underscoring a resemblance between the two episodes (the reader is invited to look up both stories, the former in M 9:18-26 = P 5:22-43 = L 41-56 and the latter in A 9:36-42). As it is, I am not sure that Luke (or Peter, presumably Mark's source for his account) intends a connection.